Size: 13 cm in length from the beak to the tip of the tail. The Society Finch is considered to be chocolate in his original form, although there is no way to prove it since there/s no wild birds of this specie. The beak is grayish, darker on top, and the surrounding feathers are very dark, almost black. The body is covered by different brown shades, lighter on the chest area, and almost creamy in the belly. Although named as a solid color, the plumage of this bird as a pattern that resembles the White-rumped Mannikin. These birds are extremely sociable and they will do well in species of the same size and temperament. Very gregarious, they are known for being extremely easy to breed. These peaceful birds have loud voices, but as boisterous singers the melodies shouldn’t upset the neighbors. Only the male sings, while the female vocalizations are extremely limited. The mating song of the male is usually accompanied by a hopping dance on a perch and the fluffing of the feathers, especially the tail. Millet and other small cereal seeds, plus greenstuff. 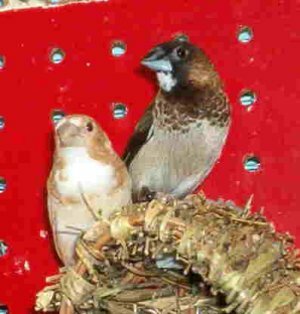 Peace during breeding; do not disturb the Bengalese Finch, even if known as a bird that allows regular nest inspections. Don't allow more than four broods per season, and avoid winter breeding. Bengalese finches love to fly and need a minimum of 20 inches of horizontal space to accommodate this natural behavior. They appreciate as big a flight zone, as you can give them. Although very social with their own species, in fact, needing this social interaction, finches do not like to interact very much with humans. 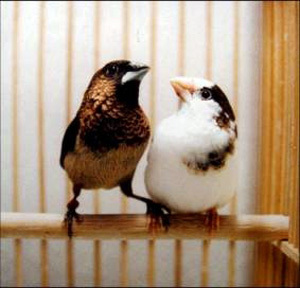 The Bengalese Finch is Suitable as aviary and cage bird. Compatible and breeds readily. Male sings during breeding season. 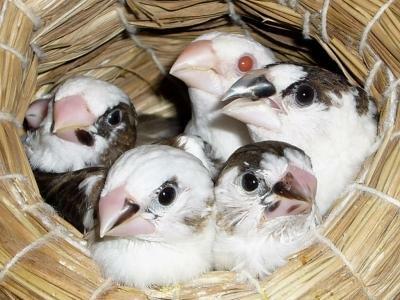 Supply with ample half-open nest boxes, 25 X 25 X 25 cm, and nesting material (coconut fibres and grass). Lays 5 to 7 eggs, incubation 18 to 21 days by both parents, fledging 20 to 24 days. Fed by parents for another 40 days, then move to large box cage. Young should not breed until at least 1 year old. Also excellent as foster parents. Return foster nestlings to natural parents once they reach adulthood; otherwise the young will want to stay near their foster parents and won't associate with own kind.